1. I haven’t been able to figure out a job thing the past several months since I was laid off. I wasn’t going to work at all, and then I was, and then I applied a bunch of places and then I thought I wasn’t going to get a job, then I was interviewing at three places at once and then I finally accepted one job and had to withdraw my application from other places. 2. I accepted an offer with Think Through Math for a part-time math teacher position in the evenings. Works out perfectly for me. 3. I’ll be doing training in Pittsburgh from 8/31-9/4. I’ve never been to Pittsburgh. I’m going ALONE. WITHOUT HUSBAND OR KIDS. For 5 WHOLE DAYS. This feels insane to me….insanely awesome and a vacation that is!! Entire nights alone in my hotel room by myself to blog or surf the internet or whatnot?? Wheeeeee!!!!! 4. Oh, but I’m kind of nervous about missing my kids and feel a bit guilty pushing them off to KP for so long by himself. 5. Luckily his freelance job will allow him to make it work. 6. Several years ago, KP was hired as a writer by this one guy, N, who wanted to create a tv show somehow incorporating a (somewhat infamous) website he owned. KP and N pitched it to several networks, all passed. I liked KP’s surprisingly encouraging take on it and perhaps surprisingly would have supported it. It’s interesting to think about now. 7. I joined a local MOMS Club. I don’t know why I never had before. It’s like there are friends to be had that I never even knew about. If you’re lonely, moms, look into it. 8. Thanks to my first MOMS Club playgroup this morning, my kids are both napping right now. And may sleep for hours. 9. I made some changes to my blog sidebar. Yes, totally selling out with those affiliate links. Whatevs. Haters don’t gotta click em. 10. Can I talk about how much I love ThredUp though? I’ve been slightly obsessed the past few months. Even sent a bagful of clothes to them just recently and got $27 in store credit. I bought some new stuff last night with that $27 credit, some return credit, and a $20 referral credit. I got 6 shirts, 1 skirt, 1 dress and 1 cardigan. Retail brand new would have cost me $334. Only $88.41 on ThredUp, but with my credit and another 10% discount I had, I paid $4.19 out of pocket! Sweet! If you’re a first-time ThredUp shopper CLICK HERE and you will get $20 off your first order. 11. I took my almost-4 yr old to the American Girl Place yesterday for the first time. I know the place has sadly changed so much over the years and it’s a shame they don’t focus more on the historical dolls anymore, BUT, STILL, can I tell you how surreal it was to talk to my own daughter about American Girl stuff?? I remember reading all the books and saving up to buy my own Kirsten doll when I was in 5th grade. In 1991. And I remember telling myself I’d save all Kirsten’s stuff for my own daughter to play with one day, and oh my gosh, that day is here. I think we’re going to start reading the Kirsten chapter books together. Our first chapter books. Sniff. Sniff. 14. I decided to start a club. A Los Angeles Screenwriter’s Wives’ Club. A place where we can all get together and commiserate over surviving unsteady incomes, high hopes, deep rejections, and the struggle to achieve some sort of semblance of normal family life amidst it all. I gotta do more planning for it, but I think it will be awesome. Ok, mainly I just want to find other cool women to hang out with who don’t (and may not ever!) have it all together either in this industry! 15. Ugh. My patent thing is driving me crazy. Have to re-submit some stuff. Don’t want to think abut it now. But it’s still going. 16. I decided to create some Algebra lessons and make videos and turn them into a Udemy course. I have the skills, why not share with other people (and maybe just maybe bring in a few bucks as passive income at the same time)? 17. Oh, my almost-16 month old FINALLY started walking a couple weeks ago!!!!!!! 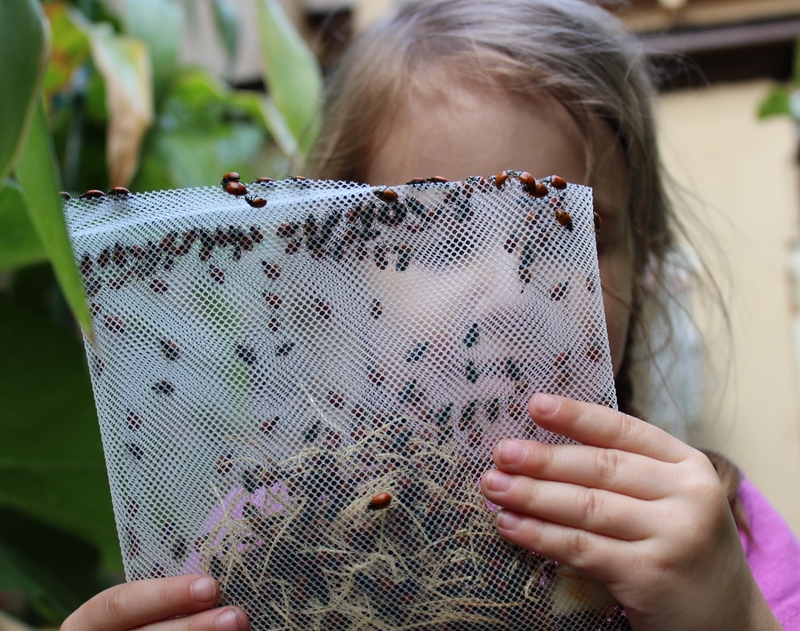 Oh and we released ladybugs. And did a bunch of other things in life that I forgot to blog about. But how cute is this, right? « When Marriage Is Hard. Really, Really Hard.